The national average voting rate is a staggeringly low 55.5%. Only about half of eligible voters voted in 2016. About a quarter of eligible voters are unregistered. To put that into numbers, over 51 million eligible voters are unregistered. Those numbers are more than enough to sway an election. To further localize this data, in Hawaii alone, the voter turnout in 2016 was an even lower percentage: 43%. Hawaii holds the lowest national voter turnout percentage. Voting is critical and a vital part of the idea of democracy our nation is founded upon. Our constitution and Founding Fathers established this country upon the basis of democracy with great effort and a vision for the voices of the people to be heard. However, it is clear we are not living up to the ideals they laid out. Over half of the population in our state does not exercise their right to vote. 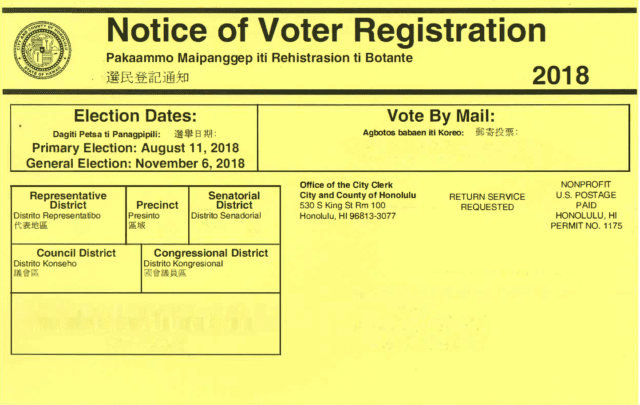 A yellow voter registration notice, such as this one from Honolulu County, is sent to voters before every election. We should be automatically registering voters when they register their cars. The poor voter turnout can be attributed in part to the difficulty in voter registration. Voter registration might seem to some to be a simple task. Unfortunately, life gets in the way for many of those who should have a say in electing their representatives to ensure they understand and reflect their interests. Most of the population of eligible voters are within an age group that is consumed with competing responsibilities. Work, school, children are among the obstacles that appear to prevent seemingly easy registration. It is common and very easy to simply forget to register. Automatic Voter Registration would likely lead to a dramatic increase in voter turnout. First and foremost, what exactly is AVR? AVR is exactly what its name suggests. It’s a system that automatically and digitally sends any eligible voter’s necessary information to the Elections Office to automatically register the individual to vote unless they explicitly decline to be registered. Getting or renewing a driver’s license, or a state ID will result in citizens being registered to vote without any extra effort or time from the individual. Nearly everyone in this state and nation visits the DMV regularly to renew their license, receive their license, or to get a state ID for employment purposes. Think how easy AVR would make it for many otherwise excluded people to engage in voting and thereby making their voices heard and their needs known. Democracy is most effective when “we the people” can express our views and opinions and can easily execute our right to vote. Without AVR, low voter turnout and a less than full representative democracy will continue. In order to achieve and maintain the grand ideals of democracy that our nation was founded on over two centuries ago, the implementation of automatic voter registration is a key stepping stone. Voting is the basic premise of democracy. AVR has the potential to radically improve the state of democracy that our nation and state is currently in. 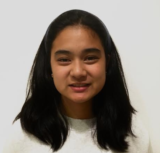 Through AVR, we can begin to become more of the America that we currently like to tell the world we are: the land of freedom and where the pursuit of happiness is for all of the people, not just some of the people. Yes, it is time for Automatic Voter Registration to come to Hawaii as it has in 17 other states and D.C. I know my generation expects it, wants it and is looking to our leaders to provide it this year.